Hi all! Today I have my lovely part time dietitian Kate popping on the blog to share a bit about her story of IBS & intuitive eating. When it comes to merging medical nutrition needs, like IBS, diabetes or other health conditions, she is a wealth of knowledge. She’s got open slots for clients in the evenings, so if you’d like to see if you’re a good fit to work together, shoot me an email and we can set up a free 15 minute phone consult. Hey guys! 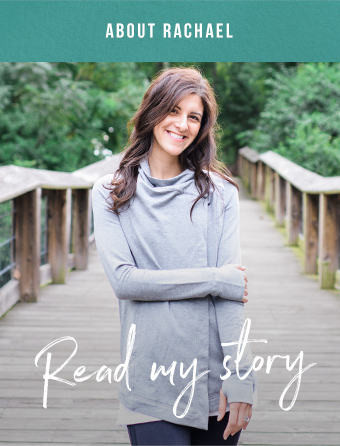 Since you got to know a few things about me in my last post, I thought I would dive a little deeper and share a story from my own journey. There are many reasons why I believe in intuitive eating, but today I’m going to talk about just one reason it has my life so much better. If you’ve dealt with IBS or other digestive problems, read on for encouragement. I’ve had digestive struggles for at least 10 years and for the better part of those years I was likely making my problems worse without realizing it. While digestive problems are complex and often difficult to diagnosis, I’ll simplify it for the story and call it IBS. For me, IBS meant frequent days feeling anxious about what my stomach may do, evenings sprawled out on the floor with crippling cramps, and an unbelievable amount of money spent on what I hoped would be “cures”. Unfortunately, this was before becoming a dietitian, so I was mostly unaware of who to trust when it came taking nutrition advice. I first went to see a gastrointestinal doctor when I was 15 and that was the first of the many times I heard “fiber, water, and exercise.” For the next several years I would hear this again and again. No matter how many times I’d say “I get plenty of all three” it was like talking to a brick wall. (But honestly, if the answer was as easy as FIBER, do you think I would be paying to see a specialist?!) Nonetheless, I followed this over simplified advice and ate a ton of fiber, drank lots of water, and exercised regularly. Yet, none of this seemed to improve my digestive problems and I’d still find myself laying on the floor almost nightly waiting for my stomach pains to cease. Around the same time that I was feeling hopeless about my IBS, I stumbled across intuitive eating. Initially I thought I couldn’t be an intuitive eater because of my IBS. I couldn’t always count on my hunger and fullness cues because I often felt overly full or bloated. However, I longed for the peace of mind and body autonomy promised by intuitive eating, so I decided that even if I couldn’t yet adopt all 10 principles, I could at least try out a few. Making peace with foods meant that no foods were off limits. If I wanted a burger for lunch and nachos for dinner, that option was available to me if I wanted it. Rather than listening to diet culture (or the “explore” page on Instagram) which told me the more fruits and vegetables the better, raw foods are superior, and white flour is the devil, I listened to what I wanted. I started to include more products made with refined flour and stopped trying to eat bajillion vegetables every day. I ordered the burger and fries over the fiber-filled salad and I could feel the difference. Much to my surprise, I felt better! With intuitive eating, I was asked to consider my own internal wisdom. For me to figure out what food felt best, I had to let go of the expectations I put on myself to “eat healthy” thanks to everything I learned from diet culture. For my IBS, what works best for me is not a diet rich in high-fiber foods. I feel best when I avoid foods like raw vegetables, fruits with skins, and legumes. I had to learn that what’s best for me may go against conventional nutrition wisdom. Of course, this is not to say that fiber is bad for everyone. In fact, for many people, fiber helps with satiety, feeding healthy gut bacteria, and stabilizing blood glucose levels. What is important to remember is that nutrition and health are not one size fits all. Trusting our intuition (and seeking help from trustworthy health professionals and dietitians when needed) can mean finding what works best for us as individuals. While I haven’t completely been completely cured of my digestive woes, I’ve definitely come a long way. Becoming more relaxed about my eating and listening to what my body really wanted was a great place for me to start.